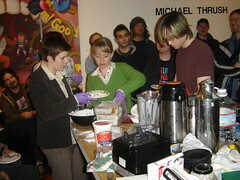 Another great Dorkbot at RX Gallery last night. Marc Powell, hacker chef and hacker hostel hotelier extraordinaire, showed us the science behind making taste buds dance. He followed up with an awesome dessert made from liquid nitrogen and purple gloves. That’s mad skillz. Pix I took. Marc was followed by Jennifer Granick, a Stanford Internet lawyer, who described how Bush’s overstepping of authority on wiretapping is an unprecedented erosion of our democratic system. No surprise there. The comparison of democratic principles to Star Wars was amusing.